Lets start 'Circuit Project' series(posts) with a simple 'Light Sensor Circuit using LDR' project. 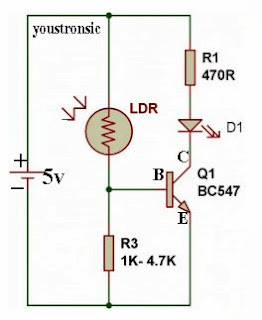 LDR Stands for 'Light Dependent Resistor' its a sensor. 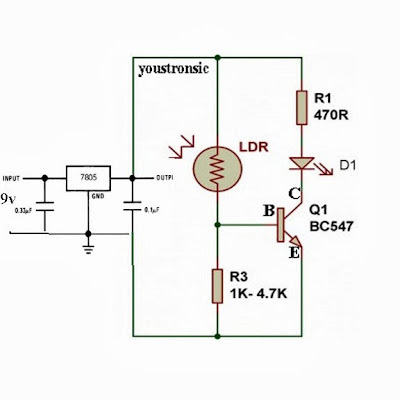 Resistance of LDR varies depending upon the light fall on it. Observe the circuit diagram below, whenever the light intensity is high which falls on LDR then LED 'D1' glow bright, when we place our hand on the LDR and restricts the light to fall on the LDR then depending upon the intensity of light, LED brightness varies. Note that transistor is acting like a switch between LED and Ground. Here we are using resistors, transistor, 5v voltage source and LDR . We know how to find the value of the resistor which we have learn in our previous post, if you dont know click on link. 7805 is an IC which converts voltage(5v-18v )input to the stable 5v output. Connect this output to the first circuit(LDR circuit). Note this is the way we convert our 9v to the 5v and power to our microcontroller in our projects. youstron thank you very much for this series of post i recently started my journey through micro-controllers. i was able to carry out this project on Proteus and it worked fine how ever i like to get a full understanding of every operation, i came to the understanding that the varying led brightness was due to current division rule between the ldr and the resistor, however i was lost on the significance of the transistor in the circuit so i took it off (shorting d1 and r3), with this the led remained on irrespective of the change in ldr resistance.